Mr Alhourani’s Dead Man’s Spots is a story about unexpected friendships, love, loneliness and loyalty and how one man’s desire to improve the lives of those around him, through simple acts of generosity, can really make a difference. Annie Grimes moves to London in search of a more fulfilling life. However, work quickly takes over as she is faced with a demanding boss, Geraldine Hall, who runs the Golden Dawn Care Home based on timetables and targets rather than feelings. As Annie watches the life savings of the elderly shrink, she begins to question the quality and type of care provided to those who are preparing to meet their maker. Her landlord, Mr Alhourani, a man with a strong social conscience, and an uncanny knack for saying things that most people wouldn’t dream of putting into words, tries his best to keep her spirits high and health in good check. He also possesses a deep love of London and does his best to open Annie’s eyes to the brilliance of the city that has become her new home. When the offer of a highly lucrative job comes Annie’s way, she begins to wonder whether money is more important than loyalty and her desire to help others. What happens if the carers become careless? Is fighting someone else’s battle more important than protecting yourself? When it comes to love, how can she get someone to shut their mouth and open their eyes to what is staring them in the face? These are all questions Annie has to answer in Mr Alhourani’s Dead Man’s Spots. “Mr Alhourani’s Dead Man’s Spots” by DM Lee was an absolute treat for me. From the first page I realised that I had found a literary home for the next few hundred pages. The book it is funny and entertaining, has several good plotlines, is at times sad and philosophical and leaves you with a warm and good feeling in the end. Care taker Annie Grimes moves from Dover to London where she gradually establishes her new and own life. She finds a bedsit, a new job and makes her first friends in the cultural melting pot that London has become. Although the story has some elements of the chick lit genre there is a lot of depth to the main character. She may be young and naïve and may remind us in some of the more sad scenes of a Bridget Jones but she ultimately has a very big and good heart and a likeable warm personality that is capable of much more than just self-pity. Her desire to help people is what gets her into trouble in the first place but the way she masters her challenges is what makes her so likeable. Particularly great are the scenes depicting the elderly people in her care home which are written with so much understanding, respect and love for the individuals. Annie’s dignified and human approach to each of them makes her a shining example to all of us who become so wrapped up in ourselves that we don’t properly care for strangers anymore – as is often said about Londoners. Annie’s landlord, the Mr Alhourani from the title, is another fantastic character. I had my reservations about him initially since he seemed portrayed as the typical Indian shop owner but I soon forgot all about it as he becomes a closer friend of our heroine and shares his unsolicited and undiplomatic advice and yet invaluable wisdom with her. He too is warm and caring and has a heart of gold and a deep side to him underneath the hard façade he has built around him. I already miss him in my own life. The Dead Man’s Spots from the title refer to his hobby of looking at the blue plaques on London buildings that honour famous people who had a connection with these houses. It brings in the element of what London as a city really is and who Londoners are – or who is and who is not a Londoner. The book brings together a variety of people – as does London – and shows how they can learn and benefit from each other, regardless of their race, religion or other beliefs. The writing is tight and flows easily and I found myself reading much faster than I would have liked in order to make the experience last. This book is lovely and highly recommended. For people that know me, they would probably say I’m prone to going off on flights of fancy, creating stories or scenarios based on snippets of information. I have always enjoyed painting, still do, but probably tried too hard to make the painting talk, I believe there is a limit of a thousand words per canvas. That might not be true. Being limited by artistic talent and word space I thought about writing a novel. At the beginning of 2012 I decided that I would write a novel, create a story that contains strong characters, written in an entertaining manner, whilst touching on subjects that I see as being relevant to today’s society. Mr Alhourani’s Dead Man’s Spots is the result. History interests me, our relationship with the past and how we try to move forward whilst improving on the past, both as individuals and as a society. Having lived in London, I always got excited on seeing a Blue Plaque. I would often cross the road to find out who lived there or what great work was conducted behind the walls of a particular home. We all seek heroes. Acknowledging past success is important in helping us believe we can create a better future. I try to convey this in Mr Alhourani’s character, the ability of a person to make a difference, at the same time portraying him as someone who looks for inspiration in the world around him. History trails behind us and we move on in the name of progress. But not all progress is real progress, especially if we start to leave important elements of society behind, children, the elderly, the family unit. These are all matters that interest me and make me question are we actually moving forward. The finished story has moved a long way from the original concept. I was going to write a story based around the loneliness of one person, living in a big city, surrounded by millions. But as I developed an idea of who Annie Grimes really was, I also began to get a clearer picture of how Mr Alhourani could impact on the story, I recognised there were other elements that could add strength to the story. It was certainly an idea that evolved, even after I started writing. Whereas, the book is based around the two main characters, I would like to think that bigger issues get brought to light, hopefully not in an over-preaching manner but in an obvious enough way for the reader to give them some thought and consideration once they’ve finished reading. From start to finish, 9 months. I didn’t start off with a set structure, plan or idea of where or how it was going to end. I had an idea in my head, which became clearer as I wrote but I tried not to limit the story by beginning with too rigid a mind-set. Writing the first draft happened quite quickly, maybe 5 weeks. The re-writing and editing is where it got tricky. That’s where I felt I had to be more disciplined. I came across some terrible sentences, paragraphs, and bits of dialogue. Scenes that were more for my entertainment, at the time of writing, rather than for the benefit of the story. I will probably look back in years to come and think you should have taken more time, but there are lessons you learn through doing and lessons you learn through hindsight. I just hope I’ve left the best bits in, removed the rubbish and told a decent story that is brought to live by characters that people can relate too. The world wide web is a wonderful tool but you do need to double, triple, quadruple check things. Just because it is on the Google-box does not mean it’s true. Books, journals, newspapers, stories passed down and cultural references that you grew up with, they all help. Asking questions and listening to people, who have experience of the roles you write about, is a great tool for gaining information and beginning your research. I spoke to a former carer to get a sense of their side of the story and view of what life might be like for old people in care. It certainly helped. When researching, the information you are looking for doesn’t always have to be written down. Speak to people, their experience can paint a vibrant picture which can be of great benefit when writing. 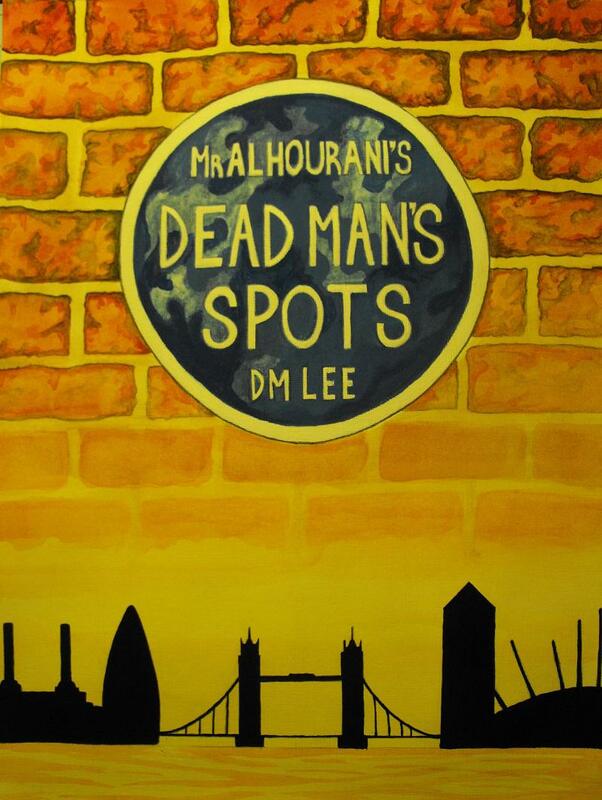 The novel, Mr Alhourani’s Dead Man’s Spots, is based in modern day London, the historic element comes from Mr Alhourani’s interest in the people that helped make London. Hence, his interest in the Blue Plaques you find all over the city, signifying the former homes of the great, the good and the truly genius. In this story, I did not have to rewrite history or create vivid scenes to bring you back in time. I have an idea for a novel that will require a lot more thinking from a historical context, it will be a challenge to bring all the facts, images and storylines together but I’m looking forward to writing it. I usually write 2000-3000 words at a time, every day. If I limit the distractions I can get that up to 8000 a day, during the first draft stage, maybe more at a push. The first draft, for me, is all about getting the skeleton of the story right, making sure that everything connects and makes sense. I approach the rewriting in a slower more patient manner. Looking to flesh out scenes to add further vitality to them. I have often written 2000 words, only to realise they are not right. You have no choice but to rip them out and start again. The time you never get back but it is all practice. Editing – is the hardest part, it’s a bit like clearing out your wardrobe, you feel inclined to hold onto things for silly reasons. In the end you have to throw away what isn’t needed. With this being my first book I thought it important that I do it. For this reason alone, if I am to become a better writer I have to be able to recognise my own mistakes, I have to be able to see what works and what doesn’t. Proofreading – trying to eliminate every single mistake from a potential half a million. I hope I’ve done well but I will definitely get someone else to do it in the future. With regards to my current writing environment, I’m blessed. I sit on a chair that starts by being comfortable, then becomes slightly irritating before eventually forcing me to get up and stretch my legs. I recommend this type of chair. For the last year I have been doing my writing in a cabin by the sea. So I have no major distractions. Perfectly peaceful and never too far from a coffee or a cigarette. After completing the first draft it took 4 rewrites / edits to get it to a point where I felt it was ready. However, the temptation was still there to go over it again. But when I thought about it, I decided to step away and allow it to be what it is. Could I have improved it? Possibly. Could I have ruined it? Definitely. One of my other big passions is painting and over the years I have learnt that, with all things creative, there comes a point where you have to accept that you have done enough, even if you still have some inner doubt. The close proximity to your work can cause your judgement to become clouded and maybe too severe at times. At the end of the day you’ve got to trust that you’ve done enough to tell your story, and accept that each and every reader will judge it differently. With Mr Alhourani’s Dead Man’s Spots it is very much a one man show – writing, proofreading, editing, I even designed the cover – let’s hope the old adage ‘you shouldn’t judge a book by its cover’ holds true. It is probably not what people would advise but it certainly has taught me a lot. Which, with this being my first book, I felt I needed to do it all, as much for my benefit as for the professionals I hope to work with in the future. Has it impacted on my storytelling? Being honest I don’t think so, that was one thing that I tried to remain conscious of and I worked hard to deliver a story with believable and engaging characters, faced with issues that most people can relate too. I will always have niggling doubts and may even have had more with a team around me helping to polish it before publication. I can’t honestly say I have a favourite author, people like Tony Parsons, Nick Hornby tell great stories with believable characters. Other writers like Robert Tressell manage to build a good story around a social injustice – The Ragged Trousered Philanthropists. I really felt pulled into the story in Shantaram by Gregory David Roberts, finding his characters nearly live like, especially Prabaker. The above are just some examples, and it is probably unfair to list those when there are so many other great writers. I probably fall more on the side of great storytelling rather great writing. I believe storytelling is the ability to capture the reader’s imagination, whereas, writing is the ability to capture the right words, to create sentences that add power to the telling of a story. In the end, if I am going to ask for your time, I need to be the best storyteller and writer I can be. That’s my aim. This is a question I have thought about, it is something that often happens when reading other peoples work too. My answer? I would rather not say. As I believe every reader creates their own idea of what characters look like based on their own imagination. All too often I have watched the movie after reading the book and felt let down by the casting. I would rather leave that pleasure to the reader. It is one of the great joys of reading. Another good one and that it is funny is a great bonus! Thanks Christoph.